As the sunset hues filter through the swirling cloud formations above Lake Audy in Riding Mountain National Park in Manitoba, Canada, a woman heads to shore after a canoeing adventure. Canoeing on Lake Audy can take you to the serene shores which are rarely explored by the summer vacationers. Lake Audy is an extremely well known place during the summer months for swimming, boating, canoeing, kayaking, fishing and photography. Every sunset differs, this one being unique with the clouds and the calming reflection off the surface of the lake. Canoeing on Lake Audy at sunset in Riding Mountain National Park, Manitoba, Canada. Model Released. 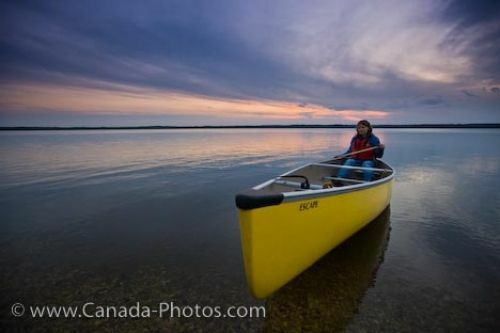 Picture of a woman canoeing towards the shore of Lake Audy in Riding Mountain National Park in Manitoba, Canada at sunset.